What features are there in the Home menu? 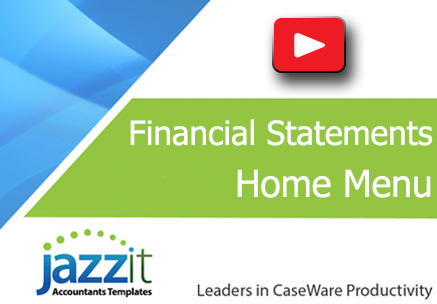 The Home menu is the control panel of the Jazzit financial statements. The following article will describe the features of the Home menu. It is recommended that Home Menu selections are completed first when working on a file. Selections in the Home menu determine the default settings in the Jazzit letters. For example setting the Home menu for Review engagements will set the engagement letter to Review as well. The Home menu is located at the very top of the Jazzit financial statements. Throughout the Jazzit financial statements you will find dropdowns with the ‘Select Page’ label on them. Double-clicking on these dropdowns will jump you to the Home menu. The Home menu is composed of several subcategories. They are shown in the screenshot below from left to right. Click on the category title to access its functions. The Diagnostics section of the Home menu offers shortcuts to various CaseWare functions. These functions are useful in diagnosing issues with the Jazzit financial statements. It contains shortcuts to a number of commonly used CaseWare functions. Accounts missing Map numbers – Opens a browse window showing all unmapped accounts. This allows the preparer to verify that all accounts have been mapped. Accounts with GIFI inconsistencies – The 4 digits in a Jazzit map number (ex: 100.1000) match its corresponding GIFI code in the working trial balance. It is possible to change the GIFI code of an account to be different from the map number. This button opens a browse window showing accounts with trial balance GIFI codes different from their map number. Using this function will help the preparer ensure that the GIFI allocations in the tax return are consistent with the Jazzit mapping. Trial Balance – Shortcut to the CaseWare working trial balance. Assign Mapping Numbers – Shortcut to the Assign Mapping Numbers dialog box. (Engagement | Assign Mapping). Adjusting Entries – Shortcut to the CaseWare Adjusting Entries dialog box. Open Document – Allows you to directly open any document in the CaseWare document manager. This is useful for quickly jumping to supporting working papers and letters (particularly when you are away using a laptop with one screen). The Display section holds a number of display/printing related options for the Jazzit financial statements including draft stamp settings. Draft – There are 3 different watermark options. 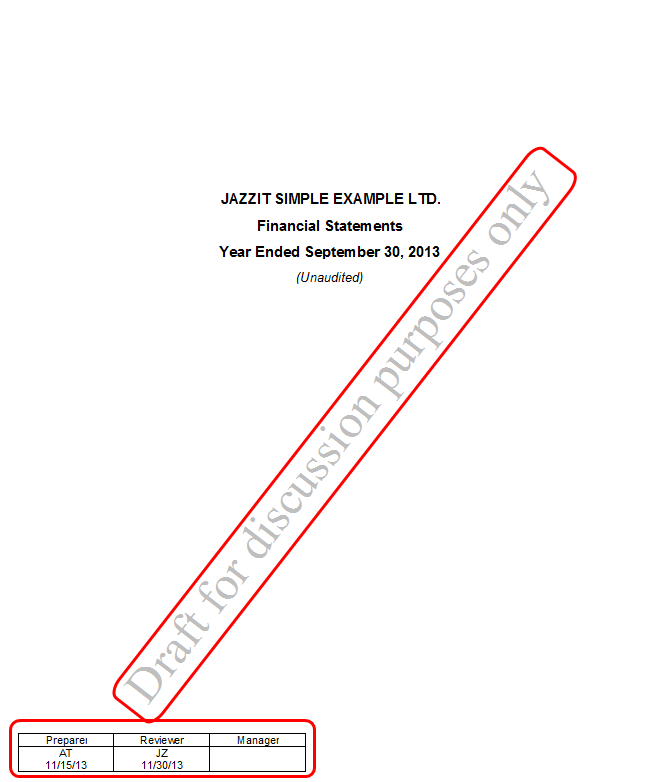 The watermark will show up when printing the Jazzit financial statements. Select ‘Off – final print’ to turn off the watermark. If you are using electronic signatures as provided by Jazzit, the draft stamp must be set to ‘Off’ in order to activate the signatures. Display – Allows the preparer to toggle between ‘Show all lines’ and ‘Show printing lines only’. ‘Show printing lines only’ makes it easier to review the Jazzit financial statements by hiding lines that are not supposed to print (i.e. nil lines). L/S – Allows you to select between 3 options for displaying/printing the L/S numbers on the statements. This option only applies to the 2 column Jazzit financial statements (not 9 column). GIFI – Allows you to select between 3 options for displaying/printing the GIFI numbers on the statements. This option only applies to the 2 column Jazzit financial statements (not 9 column). Draft stamp wording – Allows you to select custom wording for the draft stamp. The draft stamp is part of the FS watermark (see above). The Rounding section enables/disables the rounding function of the Jazzit financial statements and displays a summary of the rounding differences. We recommend that rounding is left disabled until the statements complete and the rounding differences are within the acceptable threshold. Your administrator sets the rounding threshold in the Resource Centre. If subsequent changes are made to the file, disable the rounding and re-enable to recalculate the rounding differences. The rounding threshold can be set in the Firm Profile module (RD) of the KLIB by your Jazzit administrator. Depending on whether there are issues affecting the rounding, the rounding status may change to ‘Recalculate Rounding’. If this happens, disable the rounding, resolve the rounding issue(s) then re-enable rounding. This section covers engagement related settings. These settings are particularly important for the engagement report and letters. Type – Allows you to set the type of engagement (NTR, Review or Audit). The FS headings and engagement report will change based on the selection. Letter templates (i.e. engagement letter) will automatically adjust their settings based on the selection. Wording – Select ‘Plural’ or ‘Singular’ wording for the engagement report (I / We, My / Our etc.). Letter templates (i.e. engagement letter) will automatically adjust their settings based on the selection. Designation – Controls the designation displayed in signature area of the engagement report. This will also affect the wording of letters such as the engagement letter. Default letter signature – This controls the default partner signature for the letters in the CaseWare file. A different partner can still be chosen in the individual letters if necessary. Partners in the dropdown come from the Firm Profile in the Resource Centre. This section covers client related information, including structure and ownership. It also controls how the client’s name is displayed in the letters and financial statements. Structure – Choose the structure of your client’s organization. This primarily affects the type of ‘equity’ statements that will be used in the financial statements. It will alter some terminology in the financial statements. The example below shows how the Retained earnings statement is affected by the setting. Title of Owners(s) – This changes how the title for the ‘owners’ of the organization. It will affect the wording on the balance sheet (i.e. Due to shareholders or Due to members etc). Number of owner(s) = Select whether there is a single owner or multiple owners. This will affect the wording in the balance sheet (i.e. Due to shareholder vs. Due to shareholders etc). Entity referred to as: - This affects how the entity is referred to as throughout the Jazzit financial statements and letter templates. If the option you are looking for is not available in the dropdown, it can be typed in manually. Operational alternate name – This provides an option to append an “Operating As...” name in addition to the client’s ‘normal’ name. The ‘Operating as...’ can be replaced with a custom phrase. Display federal address – This will reveal the default address for the Federal income tax filing office. This information is used in the client enclosure letter, CRA enclosure letter, and provincial tax enclosure letter. Click ‘Update to default’ to automatically fill in this area with information from the Resource Centre’s Firm Profile. Display Provincial address - This will reveal the default address for the Provincial income tax filing office. This information is used in the client enclosure letter, CRA enclosure letter, and provincial tax enclosure letter. Click ‘Update to default’ to automatically fill in this area with information from the Resource Centre’s Firm Profile. 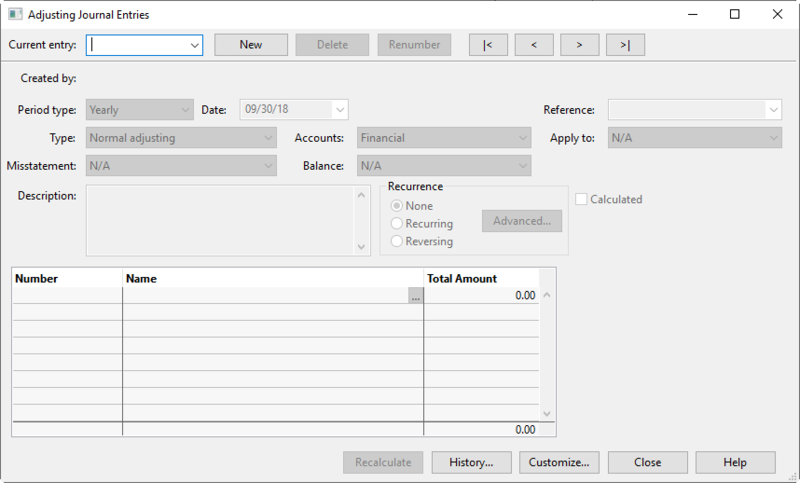 Depending on whether your Jazzit financial statement is set to 9 columns or 2 columns, you will be presented with different column setting interfaces. The following will primarily cover the 2 column interface. For more information on using the 9 column, column settings please see our YouTube video. Select Columns – There are four configurations available. The 2 column financial statements can display both columns (current and prior year) or only the current column. In addition the statements can display a % column or no % column. There will be a percentage column for both the current and prior year columns if both years are chosen. 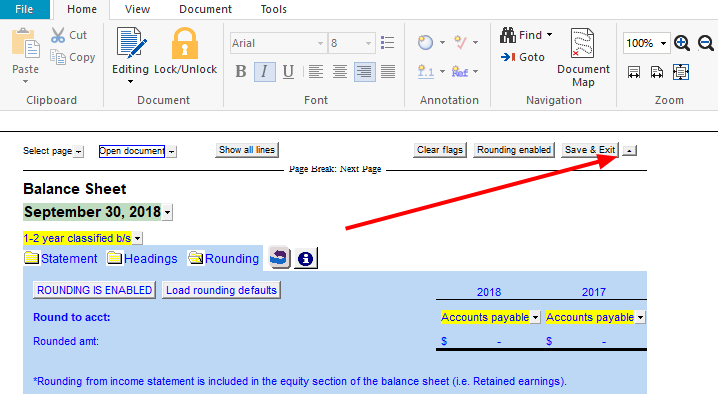 Column width – Select the width to accommodate the largest balance displayed in the financial statements. This is also useful for pulling the currency sign closer to the left of the figures if smaller amounts are shown in the financial statements. Apply CaseWare foreign exchange rates – Selecting ‘Yes’ will allow you to apply the foreign exchange rates that are found under ‘foreign exchange’ tab in the CaseWare working trial balance. Include reference to foreign currency in page headings – When the above option is enabled you will also be presented with the option of having the financial statements make specific reference to the foreign currency in the page headings. Wording for foreign exchange heading – Allows you to specify the wording of the foreign currency reference. Top margin adjustment – Enables the adjustment of the top margin by increments of 0.1 inches. Please note that this affects all pages in the financial statements. You can modify the spacing in a particular page by setting the option directly in the appropriate page header. Gross profit % - Show/hide the gross profit % in the income statement. Note this option is only available for the 2 Column financial statements OR when only the CY and PY columns in the 9 column financial statements. Optional statement prefix – This attaches a prefix to in the headers of the financial statement. Example: “Consolidated financial statements’. Please note that the prefixes in the schedule headings can be set independently of this setting. Page number – Set the position of the page number along the bottom of the page or disable the page number altogether. Note: the position of the page number may be fixed if your statement footers have been customized by Jazzit. Statement headings – Choose the position headings (left, right or centre). Note: this does not affect the alignment in the title page, it must be set independently. Show balance sheet on two pages – Split the balance sheet on 2 pages. The first page contains assets while the second page contains liabilities and equity. This is useful in cases where only a small amount of the balance sheet is flowing to the second page. Statement footers – Enter or select the text you wish to appear in the financial statement footer. A firm specific customisation done by Jazzit may override this. Current heading – Select the heading wording appropriate for the period being reported. The default setting is ‘year’, it needs to be changed if a short year or interim period is being reported. Current column & Prior column – Select the period to be displayed above the current and prior columns. 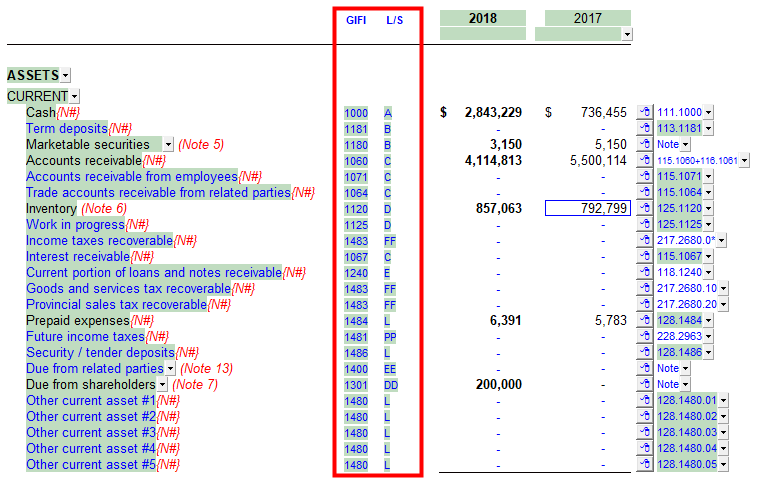 Number of lines – Select between 1-4 lines to appear on the balance sheet of the Jazzit financial statements. Signature heading – Use the dropdown to select the type of heading to appear before the signature lines. You can also manually type in a custom heading. Line one to four – Type the appropriate title to appear under each signature line. The default is determined by the organization structure as selected in the Client profile area. 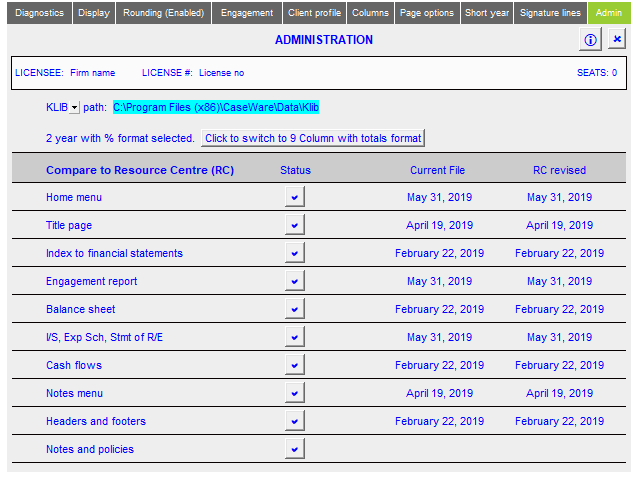 The Admin panel covers functionality related to the Resource Centre. Ensure that your financial statements are connected to the Resource Centre. If not, the admin panel will display an ‘UNABLE TO CONNECT TO RESOURCE CENTRE’ message. Click on ‘Change Resource Centre location’ and select the folder entitled ‘KLIB’ to correct this. When connected, the dates of the individual statement components are compared with corresponding dates in the Resource Centre. The status column indicates when an update is available based on those dates. We recommend updating after the CaseWare file has been rolled forward but before work on the current period begins. Click ‘Reload from Resource Centre’ to update.